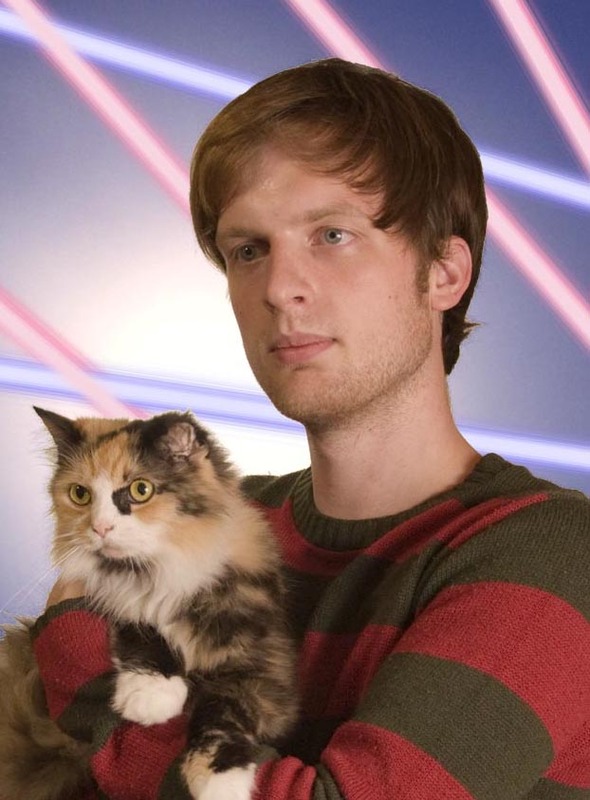 Warning: You are about to read all the spoilers on how to get a great portrait with your pet. 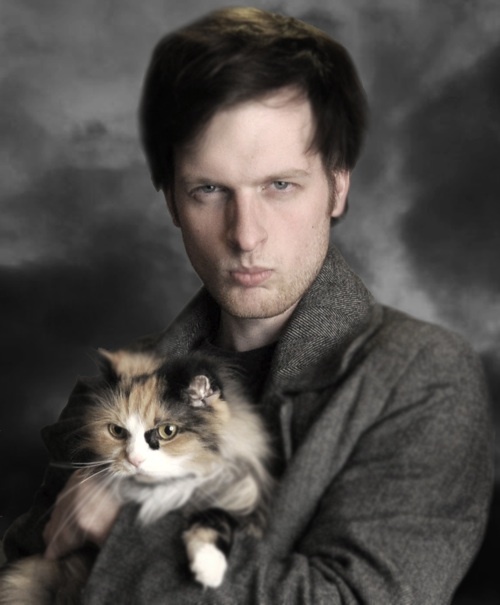 When I began taking self-portraits with my cat Waffles in July 2010, I knew no ordinary lighting studio would be able to handle such a task. I set out to put together and build my own lighting studio complete with lights and seamless paper. I was lucky already to have a gray seamless roll to get me started. While I had no floor space dedicated to taking portraits, I used the open ceiling of my basement to support the paper backdrop. By using 6 nails, 8 zip ties, and a broom handle, I was able to support the paper about 7 feet above the floor. 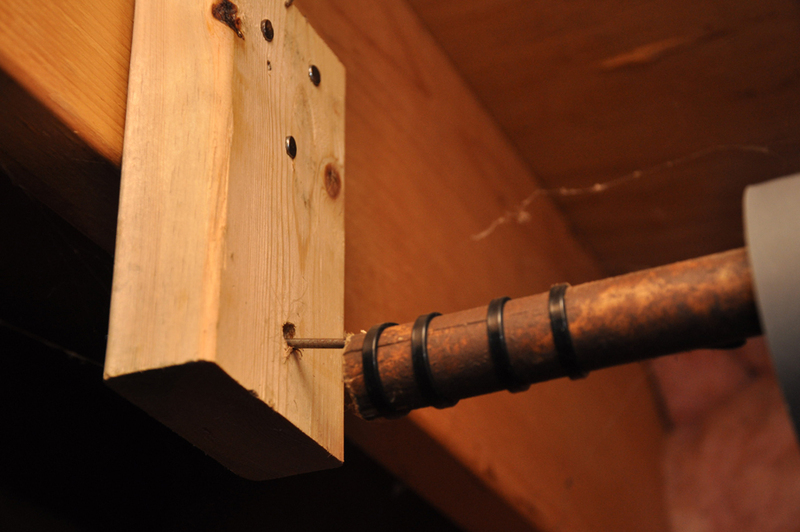 Notice the scrap 2x4 used to hold the handle. Now that I had a paper background, the lighting used to handle the task was a set of Smith-Victor Flood Lamps with white umbrellas. Not an ideal choice, but the light is contained in a small area. For camera support, I have used a Manfrotto/Calumet tripod hybrid. The legs and head can be raised high enough for me to easily walk away from the camera to stand just a few feet away with Waffles. Nearby furniture can be useful as well. 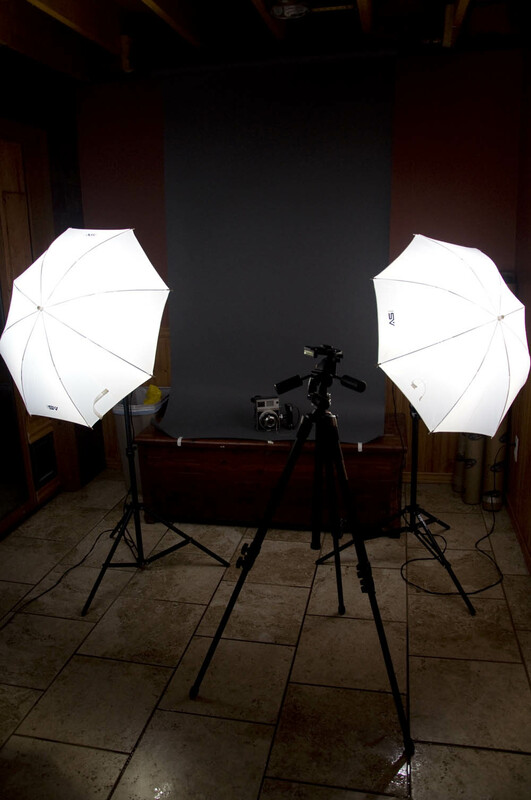 A lighting studio can easily cost thousands of dollars and months to establish a good working space. I believe at the end of this project (which was less than 24 hours), the project resulted in no money being spent. This is of course since I have no patience waiting for orders and just walked into my garage and grabbed what was closest to me. Finally, you can see the results of a DIY lighting studio clearly in the quality* and production value of my portrait with Waffles. *You are also going to need Photoshop for last part of this project. Sadly I cannot provide an accurate description on how to create your own Photoshop with zip ties and a broom handle.